The global platelet rich plasma (PRP) market is projected to witness a year-over-year growth rate of 11.8% in 2016 over 2015 to reach US$ 224.0 Mn in revenues. Increase in the number of patients suffering from orthopaedic injuries and widening application area of PRP in different surgeries is likely to catalyse the market the growth. Use of PRP therapy in treating sports injuries is also anticipated to boost the growth of the market. By type, pure PRP is likely to dominate product segment in 2016 with the revenue share of about 65%. The segment is also forecast to dominate other application segments through the forecast period. This segment is estimated to witness a year-over-year growth of 11.4% to reach US$ 144.3 Mn in revenues in 2016. Pure PRF/Leukocyte rich PRF segment is projected to register impressive year-over-year growth of 15.5% in 2016. By origin, autologous segment will continue to be the prominent segment in 2016, accounting for three fourth of total revenue generated in the year. This segment will witness a year-over-year growth of 11.0% to reach US$ 169.1 Mn in revenues in 2016. Autologous segment among other PRP origins is slated to reflect moderate market performance in 2016, is likely to lose market share to allogenic PRP over next four to five years. Allogenic segment is also projected to register an impressive year-over-year growth of nearly 15% in 2016. Examining the PRP demand statistics from different surgeries clearly forebodes the dominance of orthopaedic surgery. Currently, orthopaedic surgery is the leading application segment accounting for a revenue share of over 35% in 2016.Orthopaedic surgery is followed by cosmetic surgery, which is estimated to be valued over US$ 50 Mn in 2016. Cosmetic surgery will continue to remain the second-largest application segment, with total revenues expected to reach US$ 59.6 Mn by 2016 end. In terms of geography, North America, being the advanced market, characterized by early adopters of PRP based therapies. The market in North America is estimated to increase by 11.4% in 2016 to reach very close to US$ 120 Mn. Growth of the market in this region is supported by increasing number of cosmetic and orthopaedic surgeries. Moreover, the region is home to some of the most prominent players operating in the PRP market and hence awareness among patients is also high. Awareness among healthcare community as well as patients is also anticipated to fuel the growth of in North American market. Adoption of PRP therapy in Asia Pacific is growing at a brisk pace, fuelled by the region’s status as an epicentre of medical tourism. The region has a high geriatric population, and adoption of PRP therapy has witnessed a surge in the recent past. 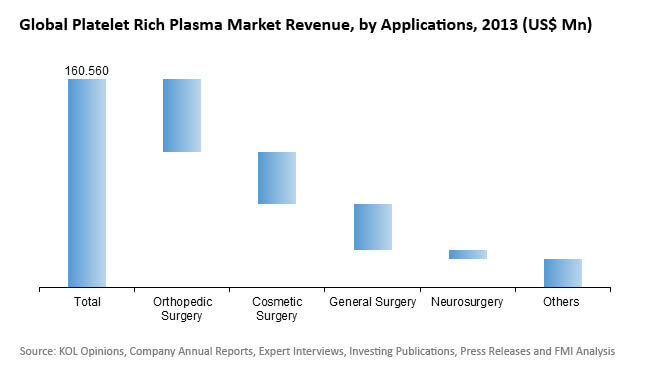 The APAC plasma therapy market is anticipated to increase at a year-on-year growth rate of 16.1% in 2016 to reach US$ 40.5 Mn in revenues. Key players operating in the global platelet rich plasma market are Harvest Technologies Corp., Biomet, Inc., Arthrex, Inc. and Arteriocyte Medical Systems, Inc. Dr. PRP America, Cesca Therapeutics, Inc., and Regen Lab SA.